Senior Fellow Catherine Powell hosted a roundtable discussion with Muneer Ahmad, a leading voice and scholar on immigrant rights, on strategies for litigating the Trump administration’s family separation policy. This post was coauthored by Abigail Van Buren, interdepartmental program assistant at the Council on Foreign Relations. We recently hosted a roundtable discussion with Professor Muneer Ahmad, a leading voice and scholar on immigrant rights. Besides being Yale Law School’s deputy dean for experiential education, Professor Ahmad also co-teaches Yale’s Worker and Immigrant Rights Advocacy Clinic (as well as its Transitional Development Clinic). Along with his colleagues, Ahmad and his students have provided legal counsel on a range of immigration matters, including a lawsuit on behalf of children separated from their parents as a result of the Trump administration’s family separation policy. The lawsuit served a as model; it was unique, in that the case was brought on behalf of kids – in contrast to other challenges to the separation policy. By focusing on children, the lawsuit put the spotlight on the cruel impact of the family separation scheme on minors. In spite of Trump’s policies aimed at weaponizing immigration law with the threat of detention to deter migrants, a federal judge declared the detention of the children unconstitutional – the first court decision in the country to hold that the government’s separation policy violates the constitutional rights of children, and not only parents. Even though hundreds of children separated from their families after crossing the border have been released under court order, the overall number of detained migrant children is at record levels. As the New York Times reports (based on Department of Health and Human Services data), “The huge increases, which have placed the federal shelter system near capacity, are due not to an influx of children entering the country, but a reduction in the number being released to live with families and other sponsors[. ]” And with midterms upon us, Trump claims he is considering a new family separation policy at the southern U.S. border. Ahmad noted how Trump has unfairly and disingenuously uses two common tropes to build support for his anti-immigrant and anti-refugee policies: the terrorist and the welfare cheat. Discussing how both tropes turn on narratives of worthiness, Ahmad explained how Trump traffics in racial stereotypes. As one of us has written, these racial stereotypes often intersect with gender tropes. On the one hand, in the “terrorist” narrative, Trump elides the notion of terrorism with Muslims and people from the Middle East. The President has escalated his anti-Muslim rhetoric in the run-up to the midterm elections, baselessly stating that “unknown Middle Easterners” were marching toward the U.S.-Mexico border mixed in with the migrants. 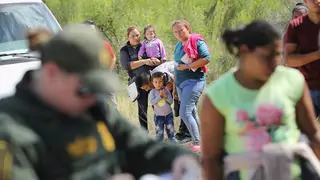 As Ahmad pointed out, Trump’s assertion of the unknown Middle Easterner slipping through U.S. borders aims to elicit the image of young, male, Muslim terrorists, and thus dehumanizes refugees and immigrants by appealing to the cultural and racial anxieties of many Americans. Trump has applied a similar trope – to invoke racial fear – to Central American men, whom the President characterizes as gang members coming to terrorize wholesome American neighborhoods. As Ahmad pointed out, immigrants are caught in a “double bind.” They are caught between the stereotypes of being lazy welfare cheats, even as they are accused of “taking our jobs.” Ahmad explained that the “welfare queen” was a successful trope in the Reagan years, and then we “sent her packing” (with welfare reform, under Bill Clinton). But now, Trump needs the “welfare queen” stereotype to do more work – both for immigrants and citizens alike. After all, the President recently signed an executive order extending the welfare-to-work requirements of the 1990s by mandating that any recipient of food assistance, Medicaid and low-income housing subsidies must join the work force or face the loss of their benefits. By painting immigrants and refugees coming from Central and South America as, alternatively dangerous and lazy, Trump sows the seeds of division and is sinking the American brand.